I had a small package of cocoa nibs at home and wanted to use them in a nice recipe – since they are on the bitter side, I thought that pairing them with the sweetness of white chocolate would work well - the creamy, gooey brownies are the perfectly vessel for that flavor encounter, and I added a touch of dark cocoa powder to the batter for extra richness. Preheat the oven to 180°C/350°F. Butter a 20cm (8in) square pan, line it with foil leaving an overhang on two opposite sides, and butter the foil as well. In a large bowl set over a saucepan of simmering water (do not let the bottom of the bowl touch the water) combine butter and chocolate and stir occasionally until both are melted. Remove from the heat and cool slightly. Whisk in sugar and vanilla. Whisk in the eggs, one at a time, until smooth. Stir in the flour, cocoa, baking powder and salt, mixing just until incorporated. Stir in the white chocolate chips and cocoa nibs. Spread batter into prepared pan and smooth the top. 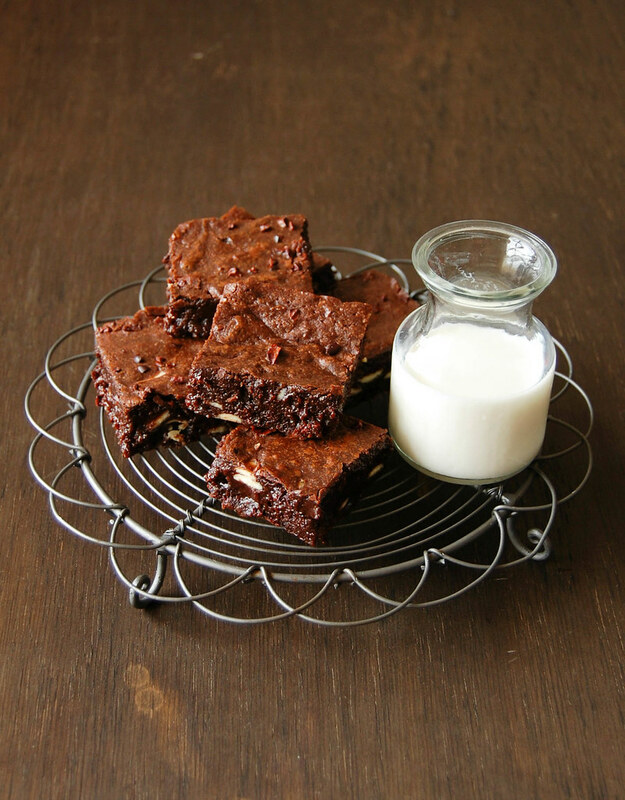 Bake for about 20 minutes or until a toothpick inserted in the center of the brownies comes out with moist crumbs. Cool completely in the pan over a wire rack. Cut into squares to serve.